A technology journalist friend of mine often makes sweeping statements regarding how well he thinks a new program or piece of hardware will fare, and he’s usually completely wrong. When Ubuntu first arrived, he declared it would kill off Windows and render Microsoft an aging OS irrelevance. When Apple launched the iPad he told everyone who cared to listen that it would be a total failure because no one would want one. I’m far less prone to making such proclamations, but I think I’m on reasonably safe ground when I say Windows 8 is going to be a dud. No version of Windows will ever be a total failure. Even Vista, which is regarded as one of Microsoft’s least successful operating systems, sold reasonably well, and I’m sure as soon as Windows 8 is released we’ll hear a lot of statistics coming out of Microsoft about how it’s the fastest-selling OS since Windows Whatever. But they’ll be statistics that we’ll have to take with a fair amount of salt. Microsoft has long believed that touchscreen tablets are the way forward. It came up with a set of specifications in 2001 for pen-enabled touch devices running a special Tablet PC Edition of Windows XP. A year later, the first such OEM devices arrived, and no one bought them. Microsoft baked touchscreen support into Vista and Windows 7, but still no one was that interested. It was only when Apple released the iPad in 2010 that tablets actually took off. With its vision of the future finally becoming a reality (thanks entirely to its far cooler rival), Microsoft has gone all out to embrace touch, creating an operating system designed specifically for it, but has thrown its core user base under the bus in the process. Windows 8 on non-touch screen devices is, in a word, terrible. The old Start menu might have been a bit of a tired concept, but it worked well and we all knew how to use it. With Metro, you’re hunting for apps, and having to learn a whole new, and rather clumsy, way of working. The OS makes using Windows with a keyboard and mouse a harder and generally more frustrating experience. The Metro interface looks nice and modern and if that’s all there was to Windows 8 we’d probably accept it. But it’s been bolted on top of the Desktop, and that really doesn’t work. It’s just an odd compromise. Yes, you can tweak the OS to disable or hide Metro, and clearly there will be lots of freeware tools that will let you completely remove it once Windows 8 has been released. But, really, why would you bother to upgrade to the new OS if all you’re going to do is roll it back to Windows 7.5 at the earliest opportunity? Surely it’s better, and easier, to stick with the OS you already own, and know how to use? The one thing that might save Windows 8 on the PC is price. Upgrading to the new OS will cost just $39.99 and this offer will even extend to XP users. It’s a move that some people will say is designed to compete with Apple’s pricing, but it just smacks a little bit of desperation to me. Of course Microsoft is gambling on Windows 8 being a big hit on tablets, which is where the OS sits far more comfortably. But the problem here is, aside from Surface and a bunch of OEM offerings you’ll be able to comfortably ignore, the sort of tablets we’re using, and will continue to use, aren’t the sort of tablets designed to replace PCs and Macs. The iPad, Kindle Fire, Nexus 7, they’re all casual use tablets that are perfect for everyday tasks like browsing the web, accessing email, watching video, reading books and playing games. I really can’t see that changing. Apple will probably bring out an iPad mini before it rolls out a MacPad. The other reason the iPad and Android tablets succeed is because people are familiar with the OS they run, because they’ve used it on their phones. Microsoft’s phones are never going to be as popular, and if users don’t enjoy Windows 8 on their PCs, they aren’t going to choose Windows 8 on a tablet. I like Microsoft as a company, and think it produces some great products. 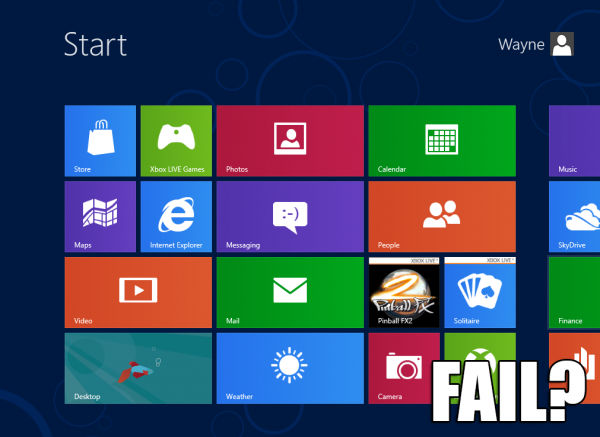 But sometimes it makes bad choices, and I believe, unfortunately, Windows 8 will prove to be one of them. As always, leave your comments below. I’d be interested to know what your thoughts are.